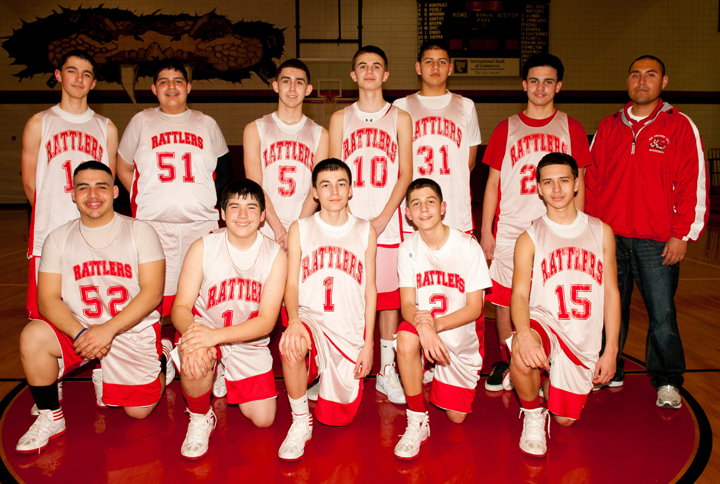 Rio Grande City High School Freshman Basketball Team named 2011-2012 32-4A District Champions! The team finished the season with an impressive overall record of 23-1, and a 17-1 District Record! Congratulations to all of our basketball players on an outstanding accomplishment and an unforgettable season! The Rattler Basketball coaching staff would like to thank the parents, administration, and community for their continuing support. We are so very proud of every single one of these young men for their hard work and dedication this season! Picture above top left to right are: Jaime Hinojosa, Joel Alaniz, Rene Gonzalez, Jacob Canales, Jose Pulido, Victor Saenz, Freshman Coach Joe Hinojosa. Bottom Left to Right are: Alex Castaneda, Andrew Moreno, Derek Jones, Esteban Sepulveda, Anniel Lopez.